Driveway installation can be a very easy process, our aim is to make the whole installation as stress free as possible, on the first site visit it would normally take about 15 minutes of your time whilst I measured the area you're thinking of getting paved, whilst doing this I will ask for indications on the kind of style and look you are wanting to achieve with your driveway, and I will offer suggestions of what could work well but ultimately you being the customer we will do our very best to make things exactly how you want them. If you decide that you would like us to install your new driveway a date for installation will be confirmed with you and in general we start on that very day. Once we start the work with you we do our very best to keep disruption to a minimum and keep the process running efficiently, we are extremely good at what we do and over the many years of trading we have a set of procedures that keep the work running smoothly and progression at a good rate. 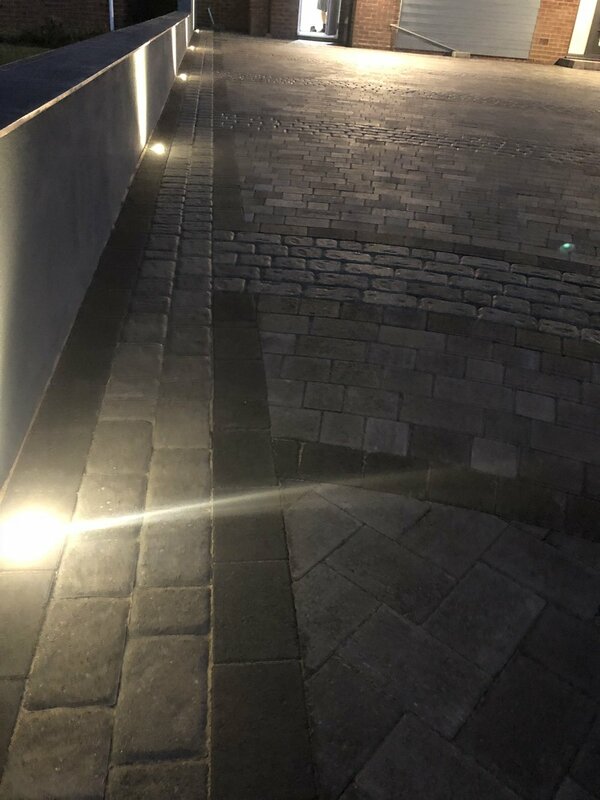 The Marshall's Drivesys block, a stunning block that we laid for this driveway with a cobble look, it has a geofix pointing between the blocks to give it a very stylish finish. This driveway was installed near to Havant in Hampshire. This driveway was installed using the Brett Omega block paver, the most economical block on the market but as shown here if the blocks installed to the normal high standard that we do even the Omega block can look stunning. This driveway was installed in Bosham West Sussex. Brett Regatta block in autumn gold with a charcoal edging was used on this driveway, we also turfed the front lawn to level. when we turned up to start work here there was no levels just a mound of mud to work through, the customer was so unsure of what could be done to make the level of the driveway work with the level of the front door, we used Brett kerbs to create the steps and the Brett Beta block in silver haze with the kerbs making the different levels pleasing on the eye, all the grounds surrounding were levelled and we used the shadow chipping for the driveway and paths to the door and re-turfed the lawns to level. Using the Brett Beta block in silver haze and re-turfing the front lawn we installed this driveway, Completely transforming the entrance to this property, this was installed in Rose Green Bognor Regis. Brett Alpha Antique in brindle with a harvest trim was used in the installation of this driveway in Aldwick Bognor Regis. giving the entrance some beautiful colour which really set off the surrounding areas.